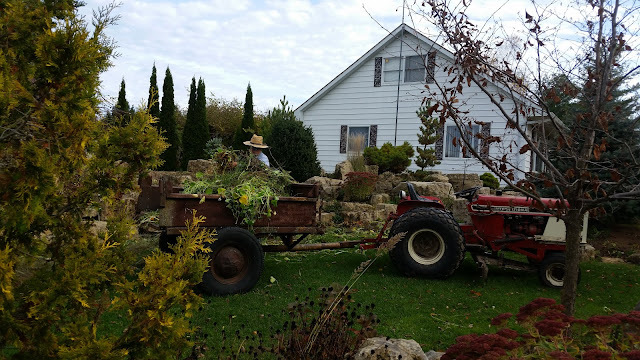 Carl and I were making slow but sure progress on our fall cleanup campaign in the garden. We were, that is, until I threw a wrench in the works. Thank goodness he's helping me; this year's schedule has been hectic and there always seems to be something going on when the weather is nice enough to work in the garden. On Friday afternoon we took out all of the annuals and frozen perennial foliage on the Pachyberm. Carl usually insists we put all the refuse in buckets so we don't have to handle all the material a second time, but due to the quantity of stuff even he decided it would be just as easy to make piles and load it up later. 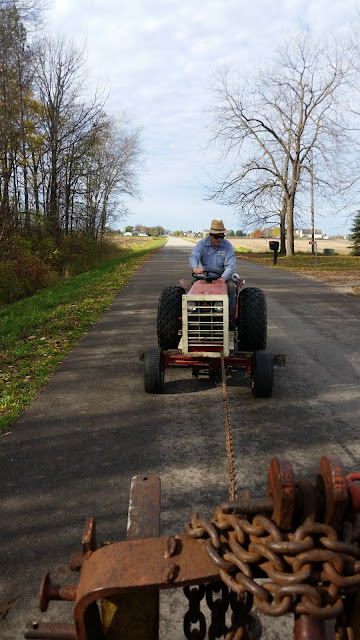 We decided to use Joel's tractor to pull our old homemade dump trailer for hauling. Joel's tractor apparently needs a new battery or a new set of spark plugs (or something) because try as he might, Carl couldn't get it started. Thank goodness for multiple tractors; we hooked up a chain and I pulled the smaller tractor out of Mom's garage. 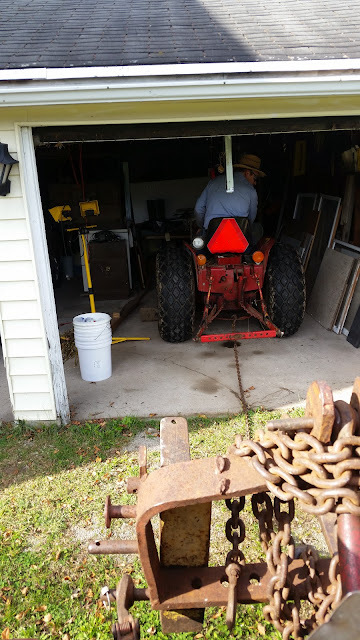 Once we had it out of the garage, Carl had to rehook the chains to the front of his tractor. 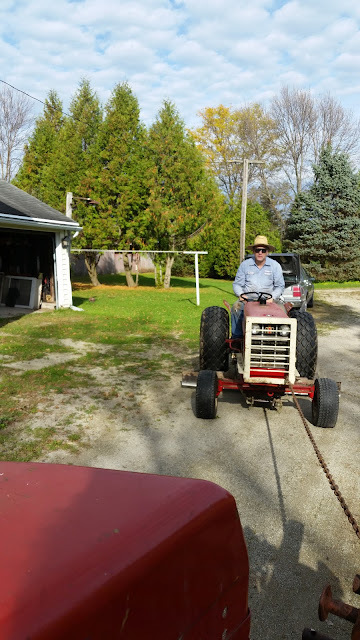 All hooked up, and at his nod, off we went down the driveway and onto the road. I'm pulling him at a fairly fast pace in road gear, and Carl lets out the clutch to turn the engine over. 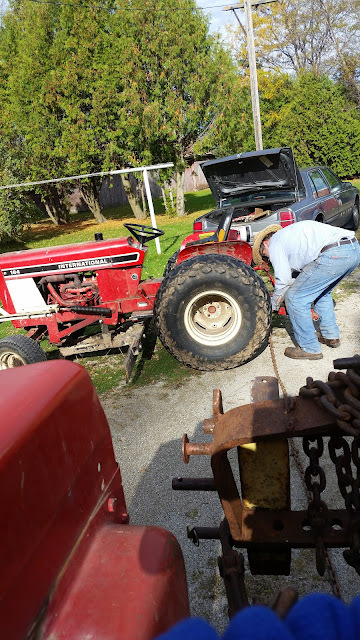 After a few tries the tractor was running. Carl got off his tractor to unhook my chains and I continued on down the road toward our house. 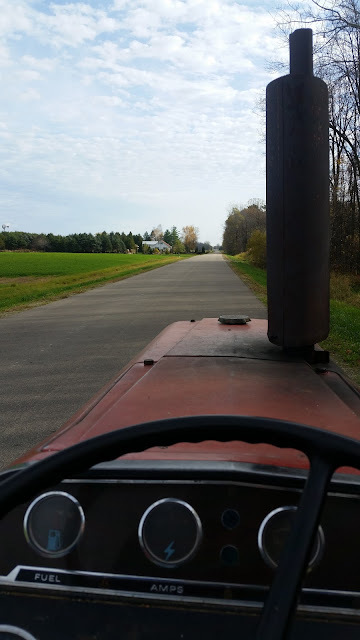 I'm enjoying the beautiful scenery, nothing better than driving a tractor on a nice fall day. 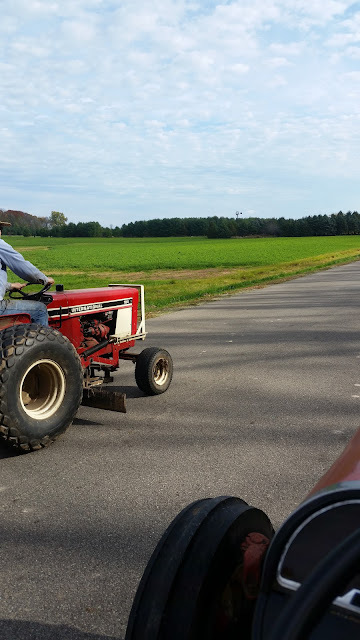 I looked over my shoulder to make sure Carl's tractor was still running and to my surprise he zoomed right by. 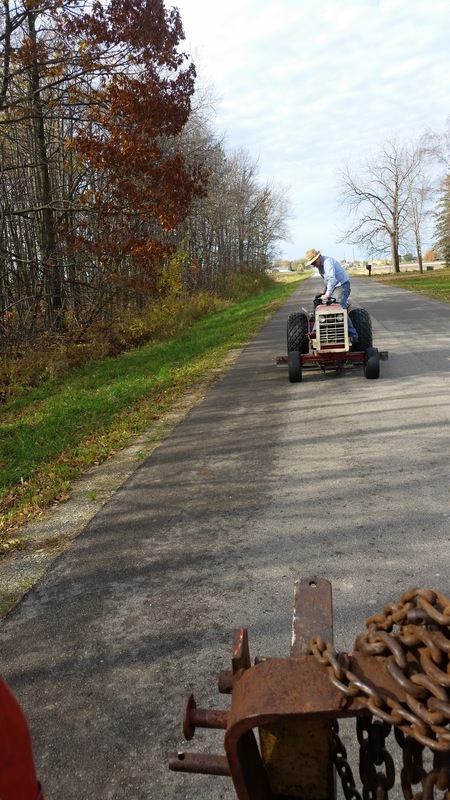 Tractor drag-racing, just one more of our eccentricities around here. I could have beat him easily, but I let him win. 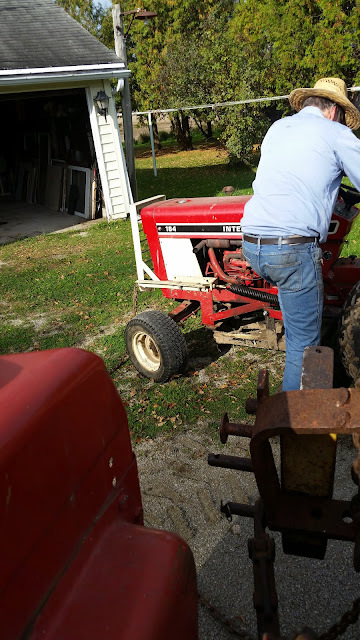 When we arrived at home, Carl hooked Joel's tractor to the dump trailer and we started loading up all the stuff we'd pulled out on Friday. In no time at all we had a full load. As our crusade to cut down on the amount of work to do around here, we had a discussion about the Pachyberm. This garden is in need of remodeling; the weeds are getting the better of us on the north side and we're both tired of battling them. I suppose for anyone wondering what in the world a 'pachyberm' is an explanation is in order. We named the Pachyberm after a derisive comment in a gardening forum from years ago on the overuse of berms in gardens. "Why would anyone want a raised bed?" the author questioned. "Are we to believe these gardeners have elephants buried in their back yards? 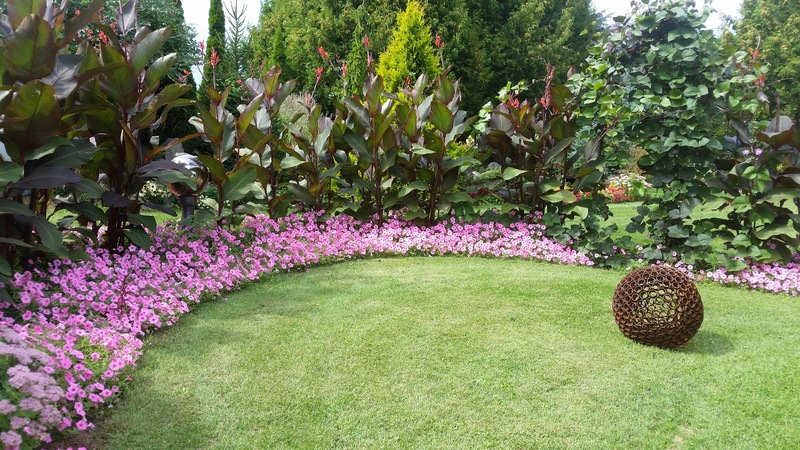 That would seem to be the only reasonable explanation for a large mound of soil." The two 'Things' never tripped my trigger; they were okay, but in the end it all comes down to maintenance. 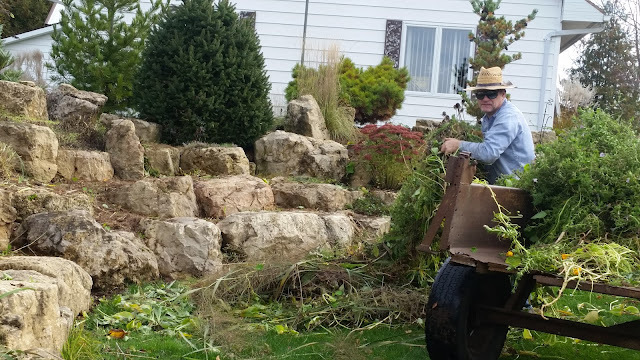 We've got enough to weed, way more than we need. 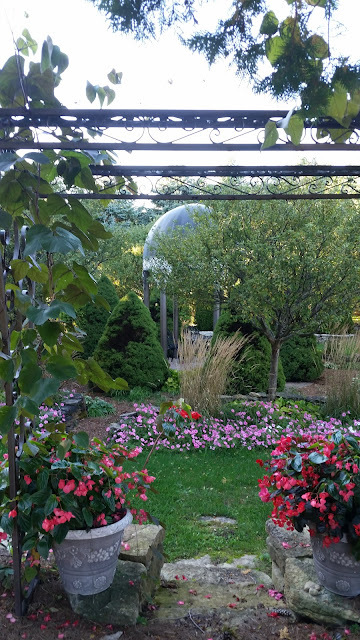 When people ask me what my favorite part of the garden is, my answer is always the same. The Escarpment: shade, rocks, hostas, and very few weeds. And rocks, did I mention rocks? 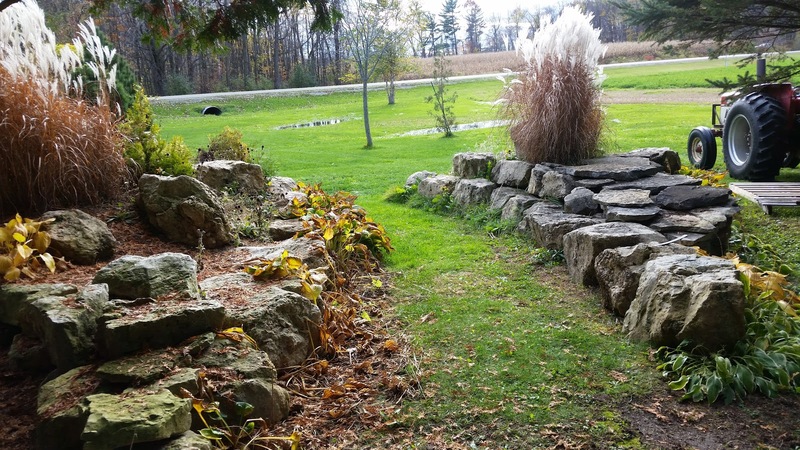 We have always loved the look of natural stone walls in nature, as seen in the picture above at a county park. 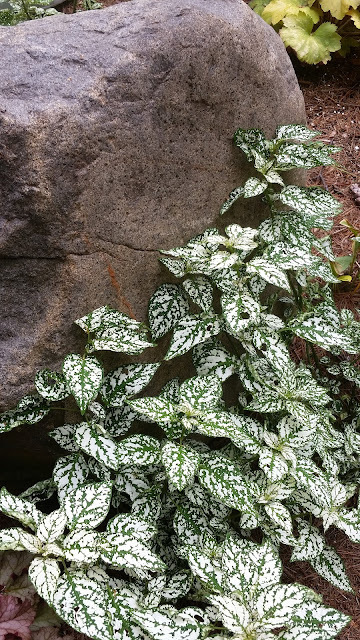 The moss-covered rock formations often form nooks and crannies which are shady and cool. 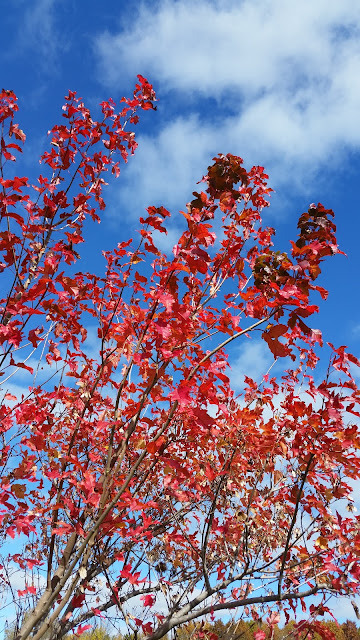 Carl and I decided to try to replicate Mother Nature's artistry as best we could over the years, but we both admit compared to her, we're rank amateurs. 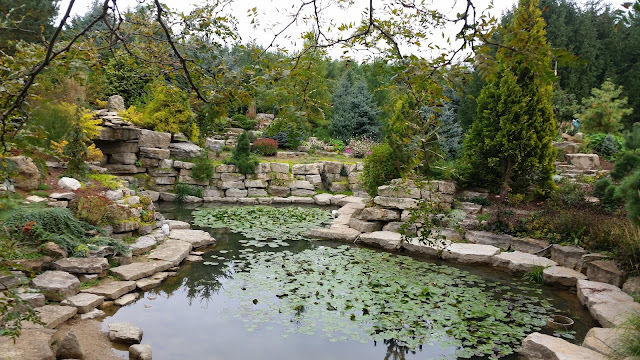 Another problem we have is quality of the stone we were able to acquire and the fact we don't have the equipment to lift our stones as high as we'd like, but we have made do with what we had. The Escarpment bed shares a similar look with the back of the Quarry Hill. So, yeah, the 'Things' project was not a resounding success. The problem was the rock we had left to work with was not as flat as our earlier projects, making construction a much more complicated (and frustrating) endeavor. 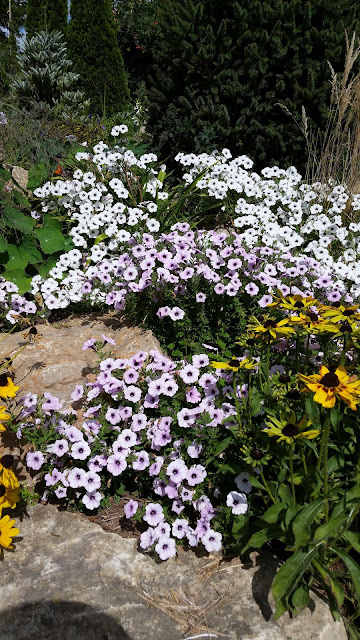 Carl's heart had not been in the project because he rightly felt we didn't need more work, and after six years of weeding the mess, I now agree. The north side of the Pachyberm has been a monumental problem. 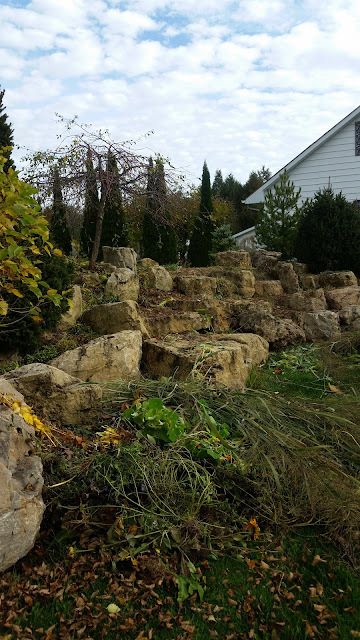 Like a kid in a candy shop, I had opted not to put as much stone in the hill as we normally do so I'd have more space for plantings. 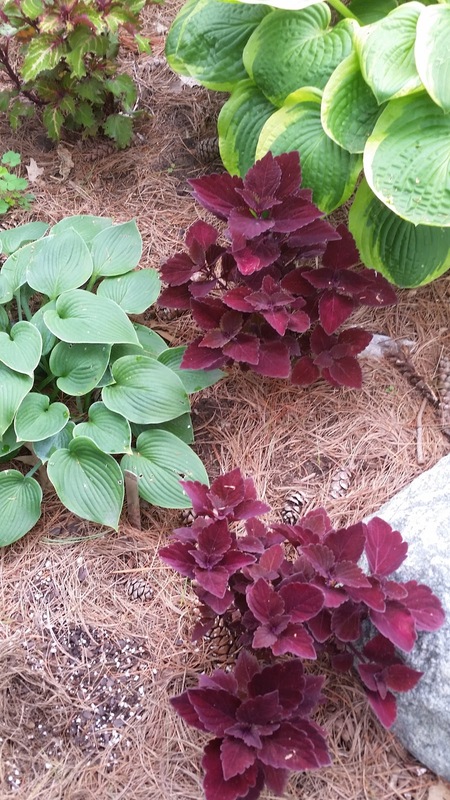 Unfortunately, this left me with more space for weeds, too. Somehow we ended up with a rampant infestation of quack grass which we've been battling every year. 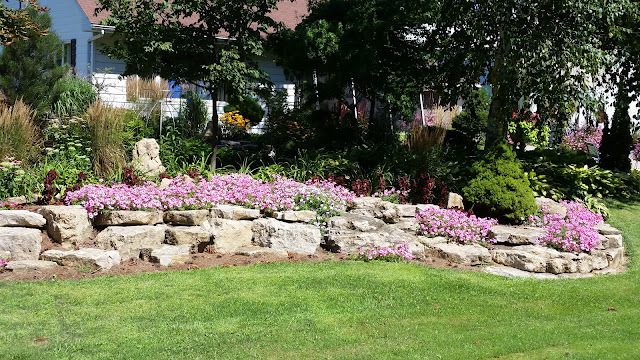 As we worked on Friday afternoon, I fantasized about removing Thing Two and using the rocks on a remodeling job of the north side of the Pachyberm. 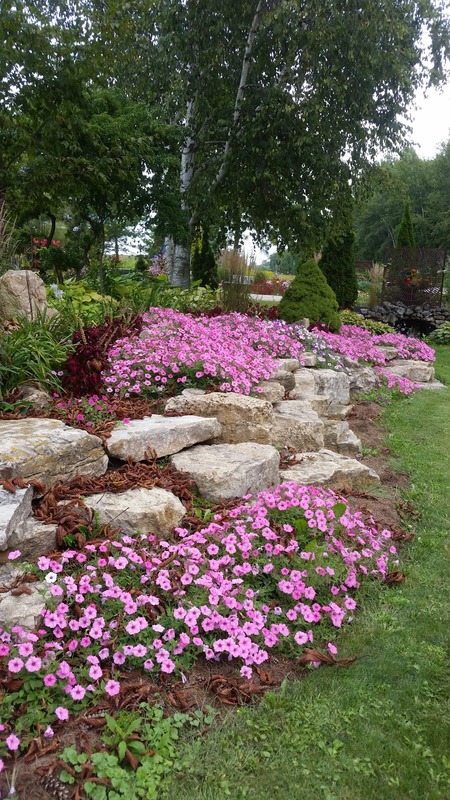 "Just think," I gushed, "We could take all those rocks and cram them into the hill here and cut down on better than half the weeding. 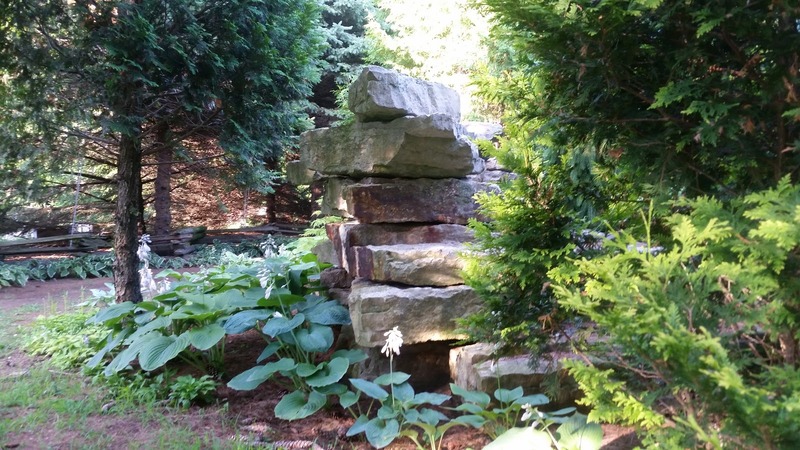 We could make it look just like the Escarpment, random stacked rocks. Wouldn't that be beautiful?" Carl looked at me and shook his head. "Yes, it would be nice, but we don't need any more work, do we?" "No, but you're always saying we have to cut back by fifty percent around here; this is would be a good place to start with since it's our biggest headache," I said. All afternoon we went back and forth on the topic as we worked. Construction on Castle Aaargh has finished for the year as it's now freezing at night. 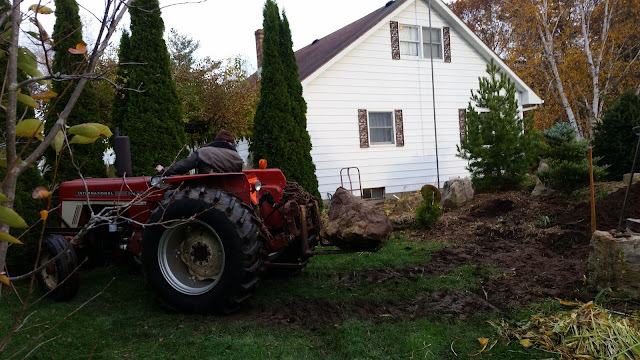 When we applied for the sanitary permit for the new septic tank a few weeks ago, we were told it would be doubtful it would be installed any more this fall due to excessive rainfall. "Next spring is looking to be a very busy time," I grumbled as I tried to find the end of a quack grass root in the muck. " 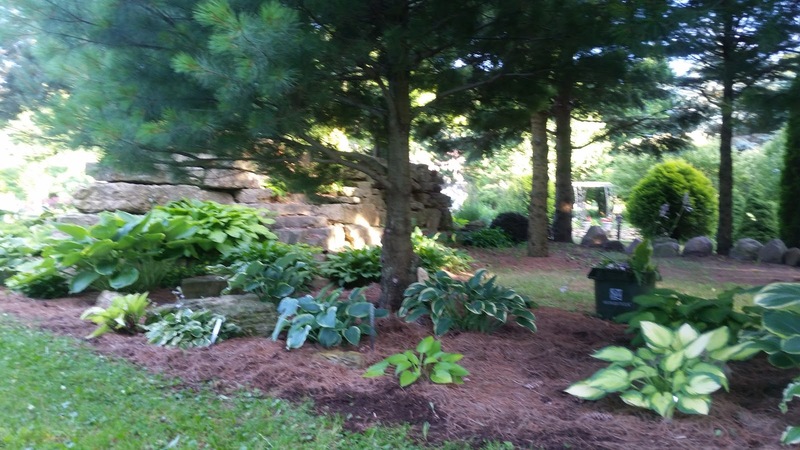 Since the septic won't be done until spring, I'm thinking we should get a jump on this area." "You really think this is a good idea?" Carl asked. "We don't know how long the weather will hold." 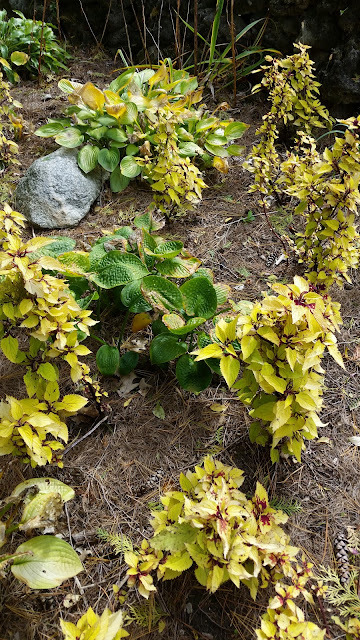 "True, but I know you're just as sick of weeding this disaster as I am, wouldn't it be nice to have nothing but rocks here?" My wheedling worked. Carl sighed, "Ok, I guess. Let's see what we can do before the snow flies." The first thing was to move all the plants in the area to be renovated. 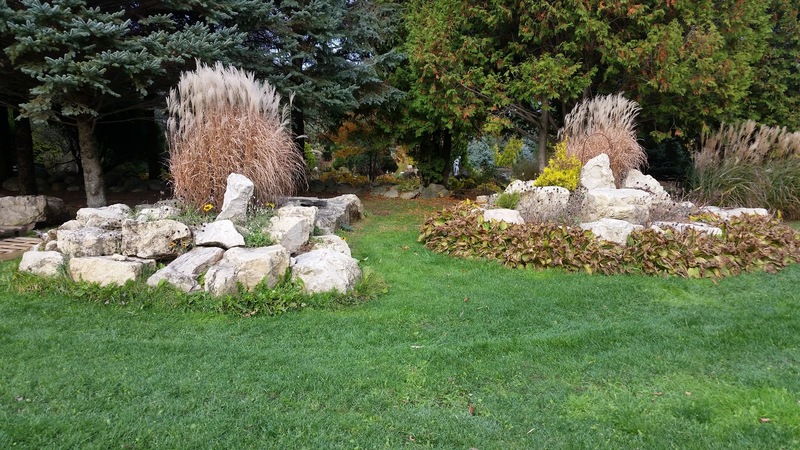 There was a truly giant 'Northwind' panicum grass on the hill which has flopped for years. We dug and pried and dug some more; Carl ended up using a heavy pry bar at one point and finally, after a good half hour battle, the grass was out of the ground. What an ordeal that was. Dwarf conifer Abies Lasiocarpa 'Arizonica Compacta' was in the way of the renovation and we carefully moved it from the north side of the Pachyberm to the south. We hope it survives the transplant; we have three of them in the gardens and they are a stunning tree. With the trees, daylilies and hostas out of the way in a miserable heap, we could start reconfiguring the shape of the hill, making it narrower and higher. The afternoon was waning and a steady drizzle was falling. We were both getting wet and our feet were heavy with sticky clay. The Pachyberm had been built with much heavier soil from when the geothermal was dug, definitely nothing like our usual sandy loam. The sun was going down and we were ready to call it quits when my phone rang. 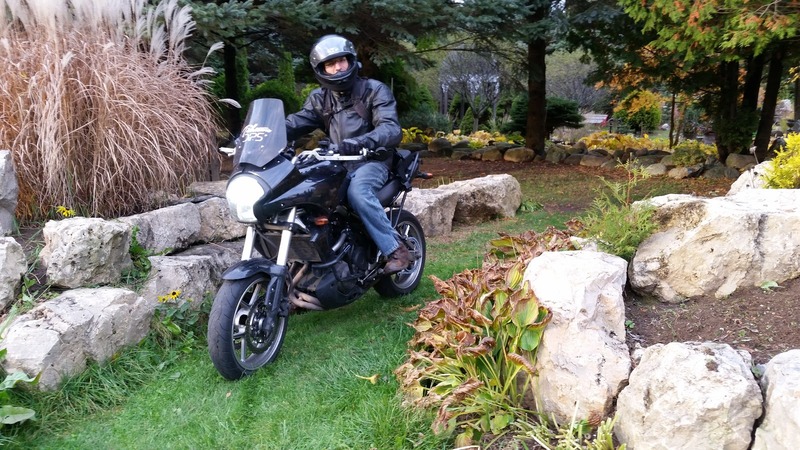 Our septic installer, Ann's brother, Fred, was on his way to survey our site and see what the soil conditions were like. We were both surprised since we'd pretty much given up on the idea this fall. After looking things over, now we're tentatively optimistic we may be on Fred's schedule this coming week depending on what the inspector decides. We determined we had to remove two large trees to make room for the mound system, so we'd might as well do it right away on Sunday morning just in case. Joel volunteered to come home and do the chainsaw honors at 8AM. The sad part is one of the trees is an over thirty-year old sumac. Sumacs don't usually grow as large as this one did, but it was right smack dab in the middle of the mound site. It had to go. I couldn't help thinking the stump had a sad 'face' here. Ok, I have a vivid imagination. Sumac wood is gorgeous, there are so many different colors in the grain. 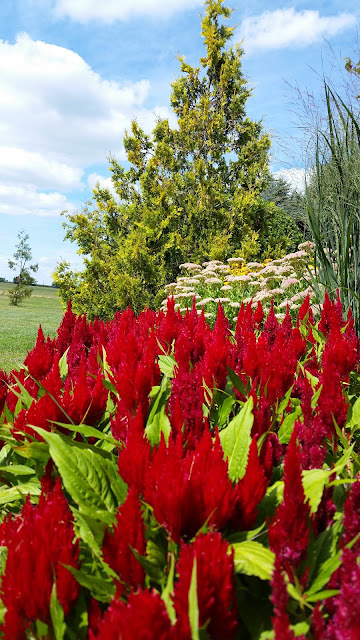 Though this is not poison sumac, some people are allergic to the wood; so to be on the safe side, we do not burn the brush and Carl uses face masks when he does any lathe turning. This is the biggest sumac tree I've ever seen. Carl kept the bigger limbs and trunk for future projects. 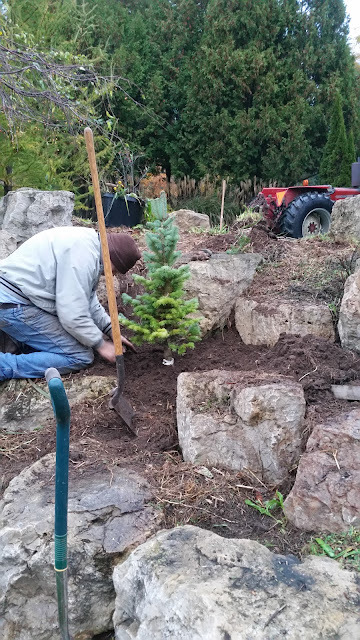 A spruce tree had to go too. We saved all the greenery for my urns and for our friend Jill to use for wreath-making. The top six feet of the tree is sitting in the pond right now; I might use it as a Christmas tree if the needles hold that long. My camera battery died before we were done, but with Joel's help, we had the trees cleaned up by 11:30AM and he was on his way home. Carl and I went to town to buy groceries for Mom and for us and after a light lunch, we were back at the Pachyberm/Thing Two renovations. David stopped in for an impromptu visit, and with any luck, this may be the last time anyone drives between the two Things. Thing One is on the left, Thing Two is on the right; for now, Two is safe from demolition. Carl and I shoveled muck up the hill and moved about six big rocks into place this afternoon. 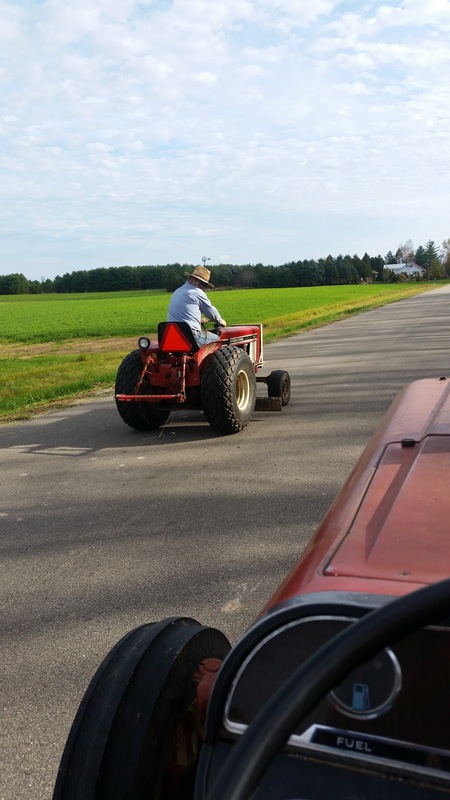 What a job; it's hard to drive the tractor because the clay sticks to my feet and causes them to slip off the brake and clutch pedals. There was a Green Bay Packer football game on TV this afternoon, and during a lull in the activity, I checked the 'Grandma Cam' to make sure Mom was watching her favorite team. To my alarm, she was seated in the living room with her head hanging to one side. 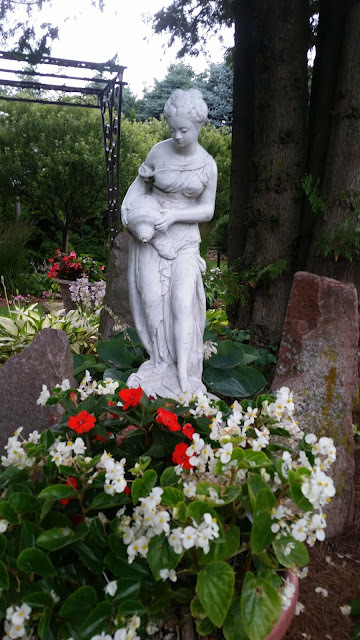 Carl called her house phone and after fifteen rings, she hadn't moved, so I jogged up to her house to check on her. When I opened the door, she woke up instantly (phew!). "I wanted to know if you're watching the game," I said, taking the remote and locating the station. Apparently the game was delayed and Mom had fallen asleep when she couldn't find it on TV. With the game on and Mom stationed in her rocker, I gave her a kiss and headed back out the door for home. We continued working until darkness descended again. The lawn is all chewed up from the big lugs on the new tractor tires, but I'm still optimistic. This coming week is going to be a doozy, like usual, I know we've bitten off more than we can chew. But that's nothing new. Carl said he's either out of shape or the rocks (and gravity) are getting heavier. 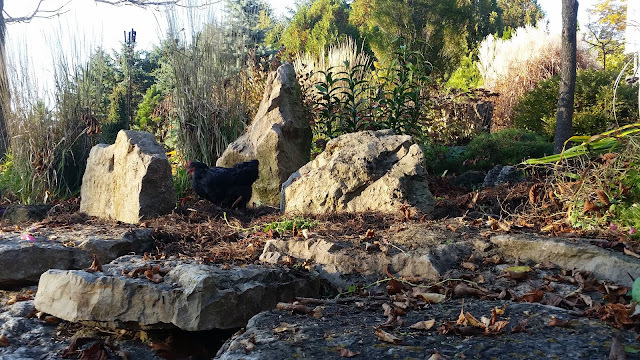 I agree; I was dangling off the end of a crow bar this afternoon while he was trying to shove some muck under one of the boulders and it was all I could do to keep one end of the rock a few inches off the ground. Surely it wasn't this bad the last time we moved them? I mean, really, we're not getting that much older....? 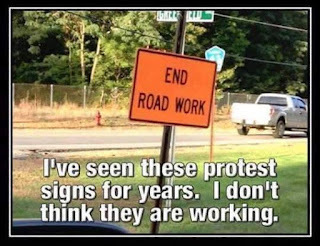 Ok, we are, but I encourage him by pointing out we're cutting back on the work in the long run. (Hey, it sounds good.) My timing kinda stinks too, especially with the septic work a possibility this coming week. But I don't want Carl to revolt. These sort of signs don't work with gardening, either. It's a gloomy forty-three degrees Fahrenheit this morning. With Carl's help, I've got the front garden (our smallest bed) about three-quarters cleaned out for winter. This past week was so hectic that I accomplished nothing since last Sunday night. This time of year, the frozen vegetation stays wet until at least noon and is no fun to handle. I really should have gotten at this job much sooner. 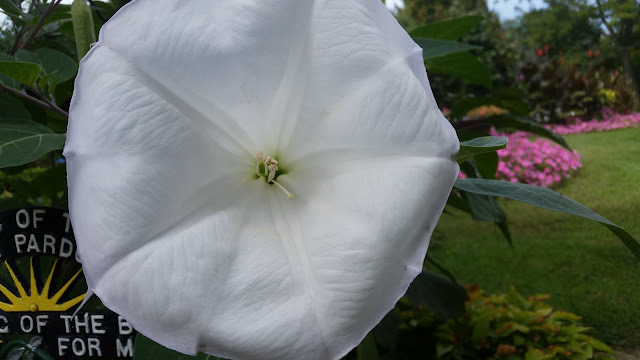 Removing the petunias from the garden is always bittersweet since they are still blooming. Thankfully, the chore is easy; I can roll them up like carpeting in a matter of minutes. The Bubblegum petunias in front of the house didn't do as well this year, normally the rocks would be entirely covered. I'm always amazed at the change when they are gone, though. At least there are rocks to look at for awhile until the snow covers them up completely. 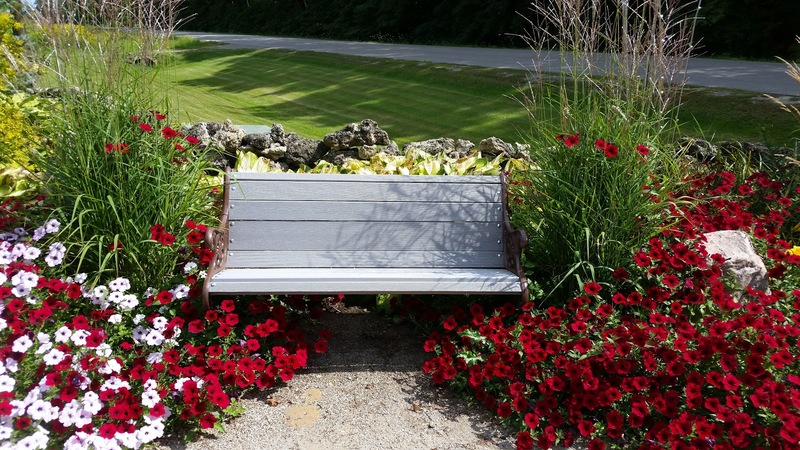 The 'Tidal Wave Silver' seed petunias are also still blooming very well, but sadly, it's time to go. 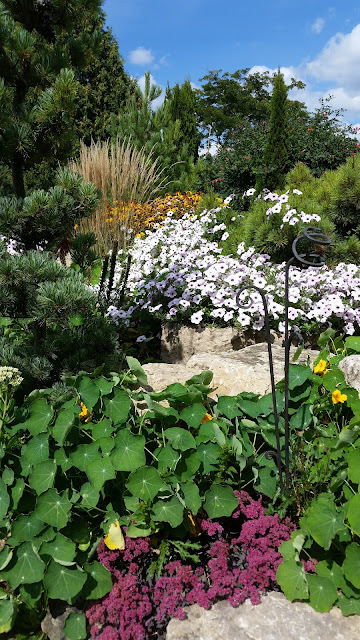 Park's Giant nasturtium were slow to spread out this season, but I think it was due to our dry weather this past summer. Every year I plant 'Celosia Fresh Look Red'. I've thought about changing my color scheme but the red shows up so well from the road. 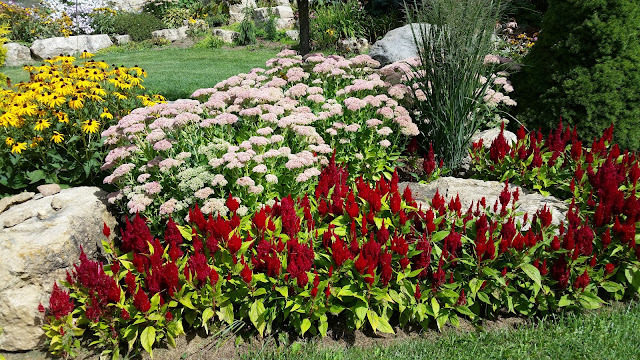 Yes, red clashes with 'Autumn Joy' sedum and the 'Goldsturm' rudbeckia but what the heck. Pandemonium reigns supreme around here. My old standby overwintered for who knows how many years geraniums are still blooming strong. 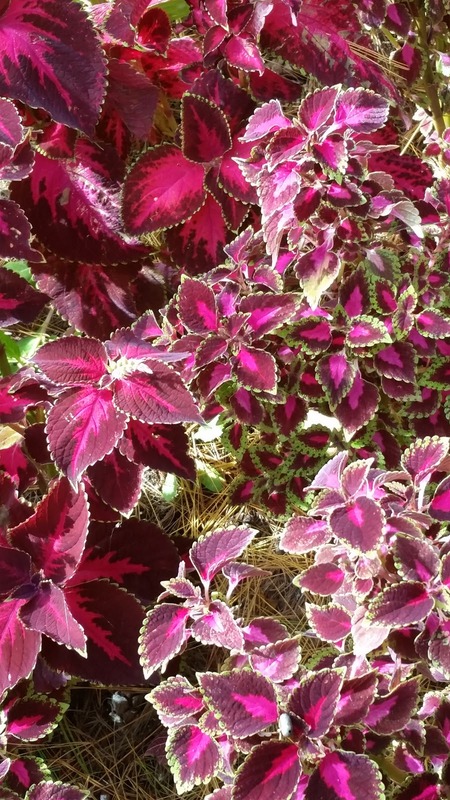 Last year I tried overwintering my pots of Dragonwing begonias and though they did survive my nearly criminal lack of attention, it was an exercise in futility. I keep all my overwintered plants upstairs in an unheated upstairs bedroom at Mom's house which has a southern exposure. They were all crammed on to two big tables and when they weren't struggling for light, they were wanting water. Badly. 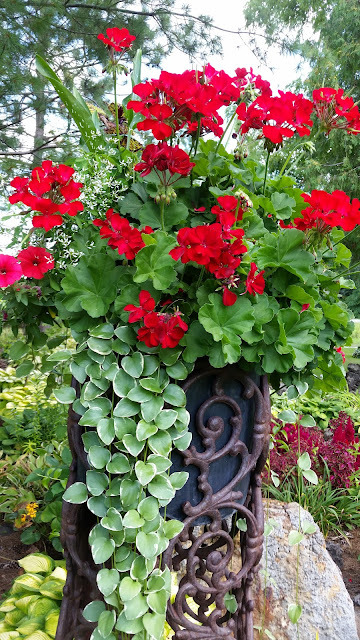 Suprisingly, the tough as nails geraniums rewarded me with abundant blooms, just as they always do. 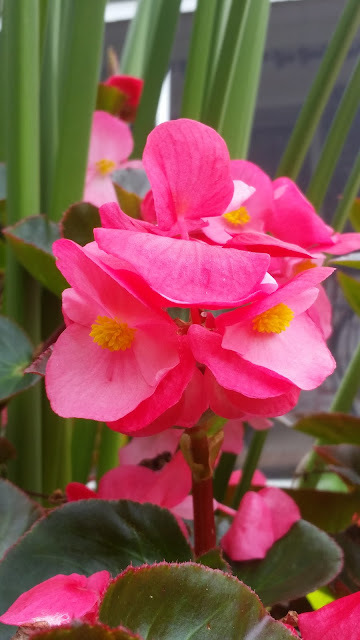 In the picture below, I made cuttings of two Dragonwing begonias and they are still putting on a show. 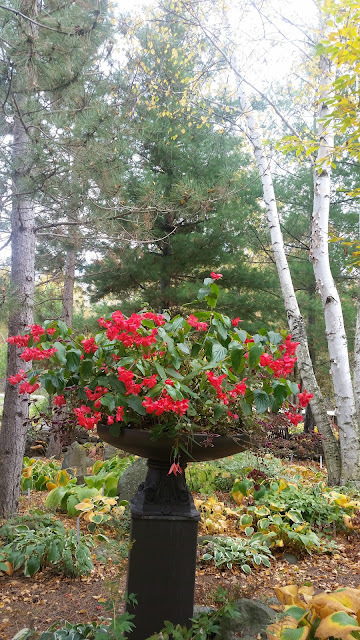 I could overwinter the pots, but I'm leaning toward laziness this year. 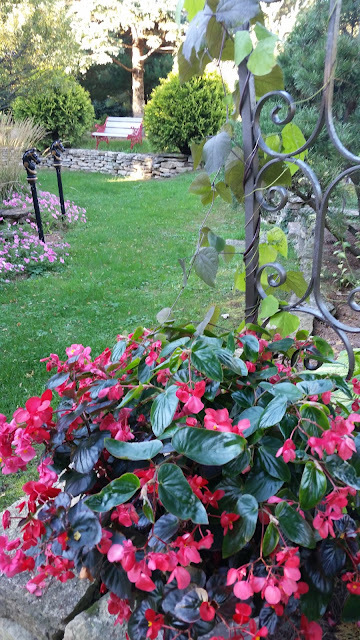 I've gained a new appreciation for begonias, though. 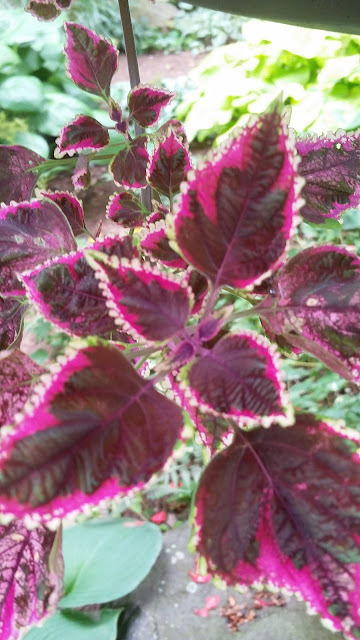 They are truly amazing plants. 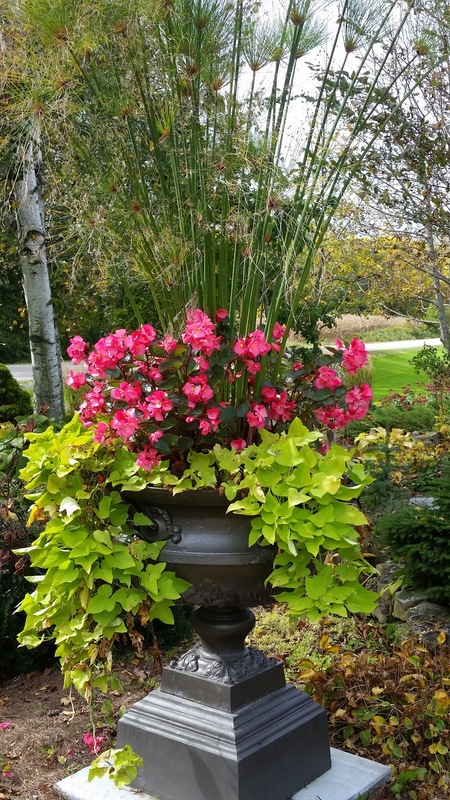 The sweet potato vine and 'King Tut' Egyptian Papyrus all competing for space in the big urn. 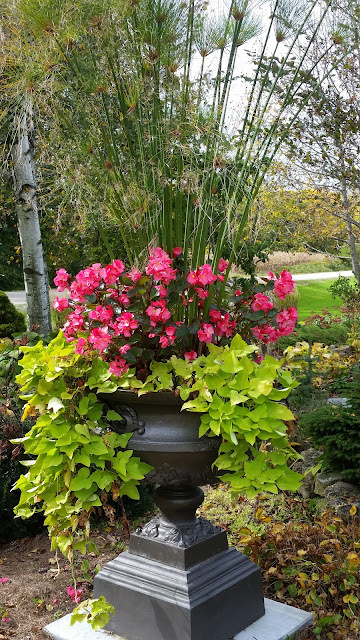 The begonias planted in Frank the Urn have half day sun and stand up to heat with no problem. 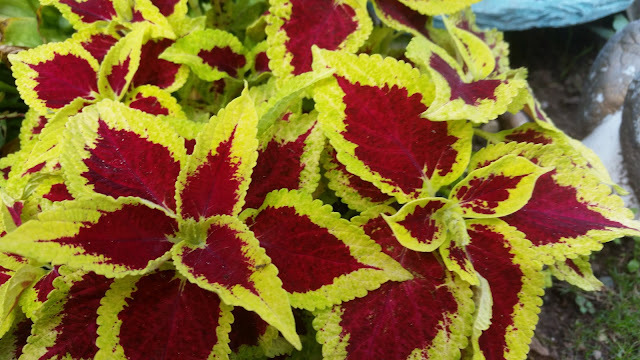 My friend, Brenda, gave me some white begonias and various coleus this year, they were lovely, too. 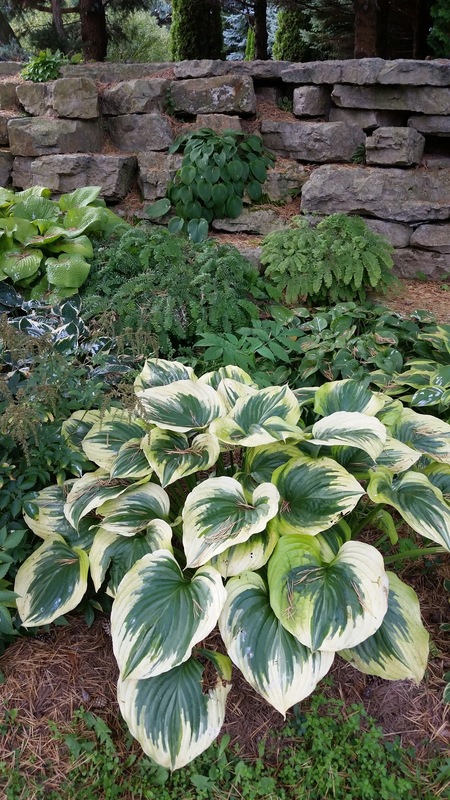 New for me this year was 'Polka Dot' plant which is still going strong in the hosta bed. 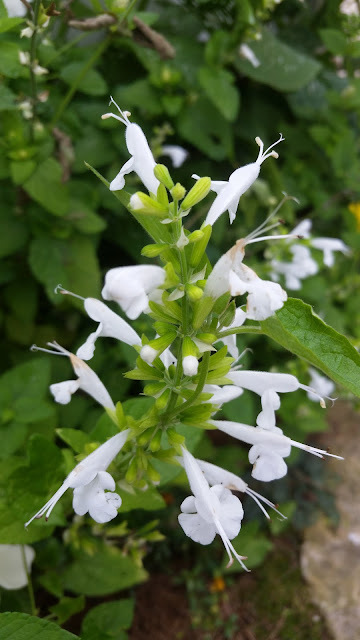 I tried a new seed annual salvia this year, 'Summer Jewel'. Though it was a beautiful flower, I can't say I was impressed; they weren't very robust. 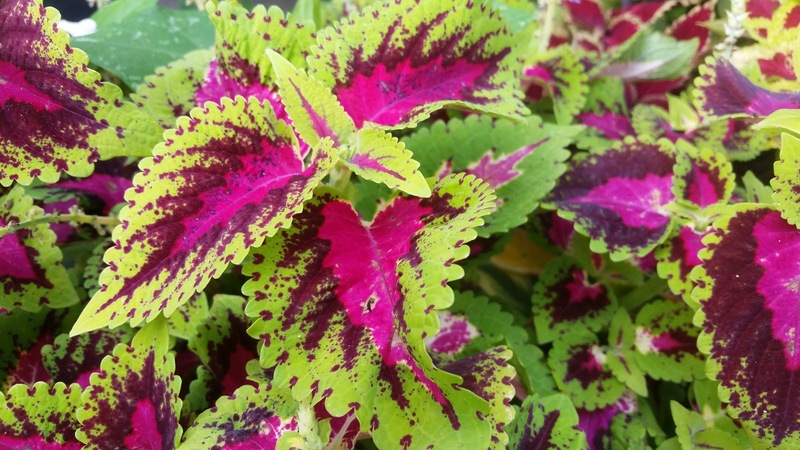 But again, it may have been the growing season or the location I chose to plant them in. I'll try them next year before I make my final decision. 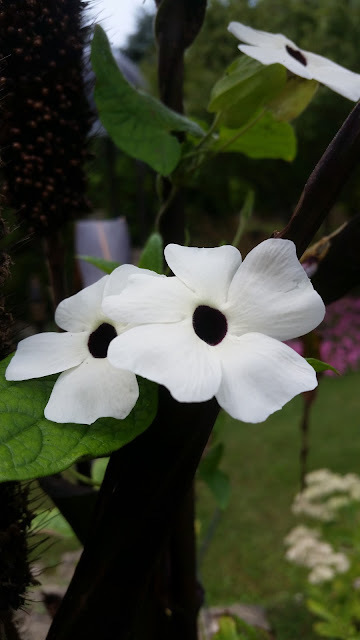 Thunbergia 'Suzie White' with black eye is usually a strong grower for me, but this year wasn't a good one for her. The vines were sparse and slow to flower. I do think the weather was a factor. 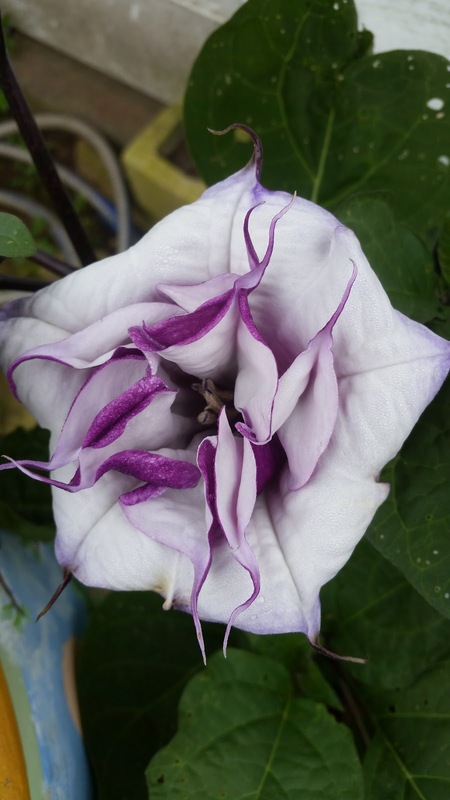 My datura 'Ballerina White' and 'Blackcurrant Swirl' also bloomed rather reluctantly this season. 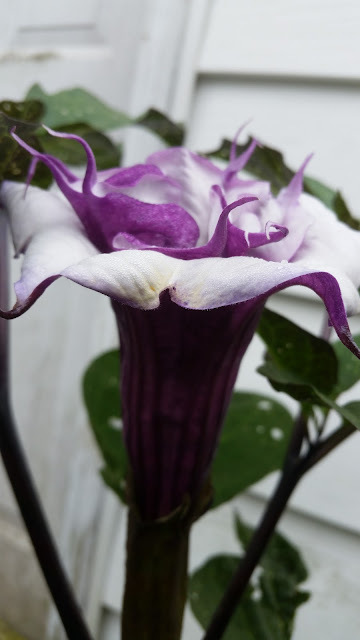 Though my photography doesn't show a comparison, these are huge flowers, fully four to six inches across. I have to go back to using my 35mm camera for photography; my phone just doesn't cut it. 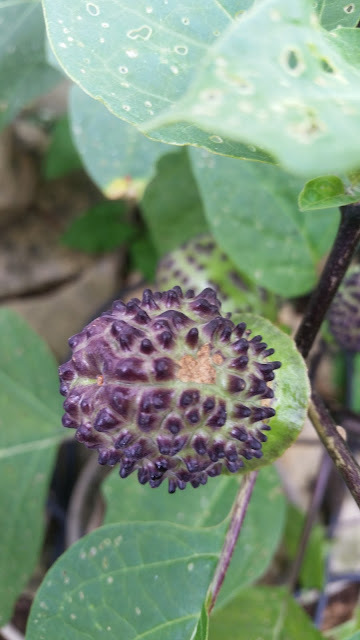 I'll be saving the seeds from the daturas and we'll try again next year. I guess that's about it for the season. Wandering around the yard a few days ago, there were a few things that caught my eye. Definitely not annuals, my hostas are still showy. Especially my so far all-time favorite 'Liberty'. I have three 'Liberty' plants and when I get around to dividing it again, there are going to be more. 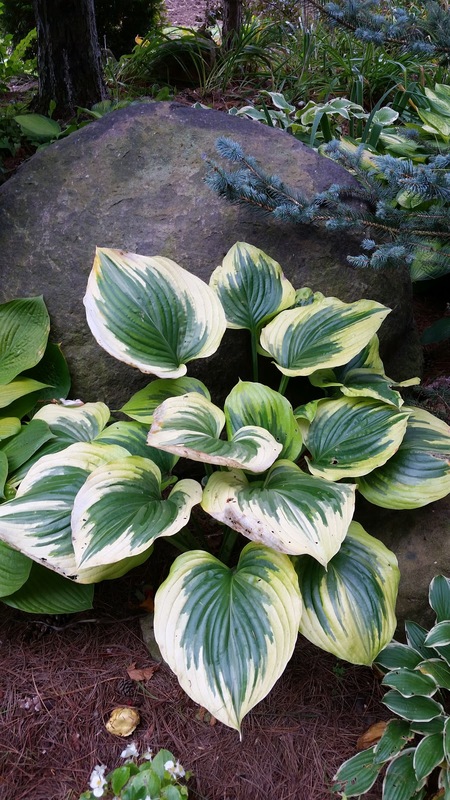 There aren't too many hostas looking this good in October. 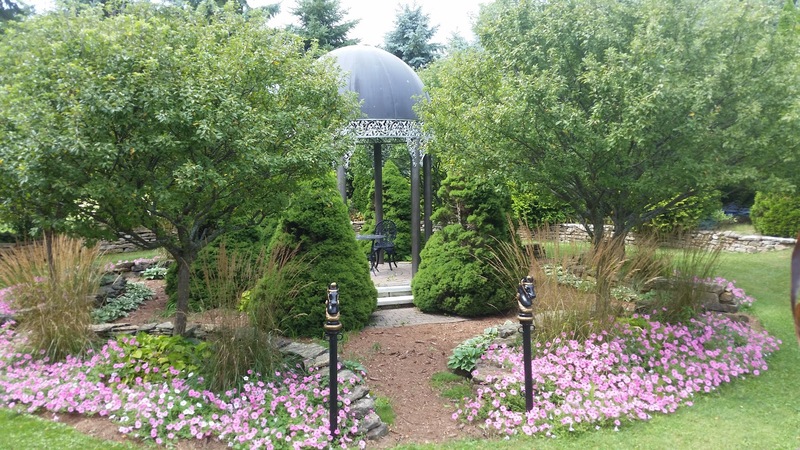 I didn't have as much time to wander through the garden with my 'good' camera this summer, so the photo quality isn't what it should be. 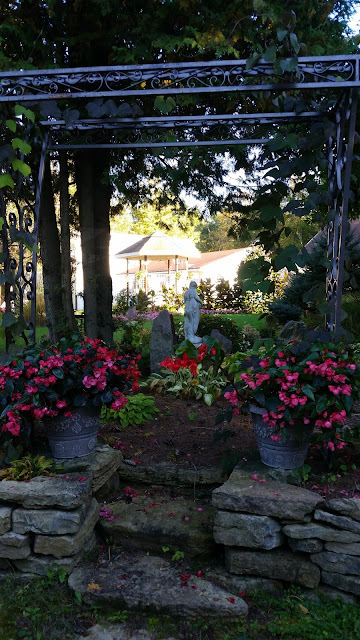 My smartphone takes nice pictures, but I have a devil of a time framing things the way I want. A viewfinder is much easier for me. The only problem with a 35mm camera is the size and the fact I'm clumsy. I've come close to dropping the Nikon in the pond when trying to photograph fish and waterlilies. Too close, but so far, I've been lucky. It's way past time to get up to Mom's for her medications, so I've gotta run. She'll be wondering what happened to me.